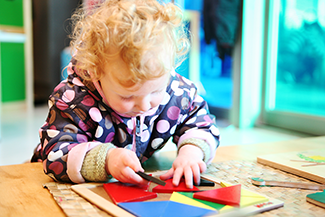 Whānau Manaaki Kindergartens has had a proud history of providing high quality early childhood education to generations of children in the wider Wellington region. We continue to do this through our culture of continuous improvement and this is largely achieved through professional support, research, and innovation. This section highlights some of the innovative projects and practices our services are involved in – all in our constant drive to provide the best possible education and care for the babies, toddlers, and young children who attend our services. Arohanui Kindergarten opened in 2014 as part of He Whare Manaaki Tāngata – the teen parent unit based at Levin’s Waiopehu College. While continuing with secondary education is a priority for the parents, their parenting role is equally valuable. “Re-engaging in education is important but it’s only part of who these young people are” says Helen. Being part of He Whare Manaaki Tāngata fits well with the Whanau Manāaki Kindergartens’ approach of providing a variety of ways for young children to experience high quality education. “We know that a “one size fits all” approach doesn’t work for all families” says Whānau manaaki chief executive Amanda Coulston. “We have a home-based service, playgroups, full day kindergartens, infant to school age kindergartens and several that have a multi-lingual approach as part of their programme” says Amanda. Arohanui is one of six kindergartens in Levin. All have features which support their specific communities, for example Taitoko, Te Timatanga Hou, and Fanau Pasifika Kindergartens offer places for infants through to school-age children to learn together. Te Timatanga Hou is open for longer hours to suit working parents, and Fanau Pasifika has a Pacific language and culture focus in its programme. Betty Montford and Parsons Ave Kindergartens are adjacent to schools and offer similar hours to school to suit parents who have children in both settings. Katoa Kindergarten is next to Takapuwahia Marae in Elsdon, Porirua. It serves a predominantly Māori community, drawing significantly from whānau affiliated to Ngāti Toa, the recognised Tangata Whenua of the area. The kindergarten is part of an integrated service pilot, which involved developing the kitchen and whānau area to encourage whānau to spend time at kindergarten and get involved. 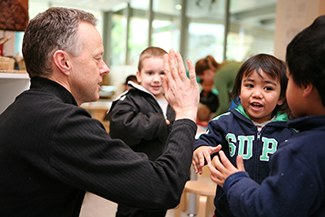 In 2012, a Ministry of Education contract enabled the kindergarten to run playgroups and parent workshops for the Elsdon/Takapuwahia community. Many activities offered draw from Te Ao Māori –kapa haka, natural remedies and medicines, and te reo Māori. There are regular visits to Takapuwahia Marae, with teachers having family links which strengthen relationships. Otaki Kindergarten has a strong curriculum focus on environmental education and sustainability. 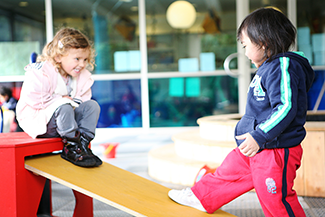 This focus saw the kindergarten being given Centre of Innovation status by the Ministry of Education in 2008, enabling research to happen and findings to be shared nationally and internationally. The culture of Otaki Kindergarten fosters responsibility for Papatuanuku (earth) and Ranginui (sky), in other words Te Ao Maori, the Maori world. Teachers aspire to be kaitiaki or mindful caretakers, with children and families as active participants. The aim was to further develop and research the kindergarten’s approach, which nurtures the mana of children, whānau and community and nurtures respect for the environment using indigenous knowledge. The research questions were: How does the ecological approach to teaching and learning impact on children’s learning outcomes and on community relationships? And how do children and families learn to respect their environment and understand the tikanga of sustainability? The research looked at children’s interactions and how different learning styles were supported by teachers - the watching apprentices, the curious workers and the pragmatic, practical ‘just get on with it’ kids. The research reinforced teachers’ view that children should explore their environment in their own way. Teachers recognised children needed to explore the ideas and values of sustainable education, and teachers needed to support them with enthusiasm and commitment. Teachers could see how children’s interests developed, their skills increased, and their attitudes to learning transformed. Flexibility and openness were important as was keen attention to the children’s involvement in sustainability endeavours. Raumati South Kindergarten and Waikanae Kindergarten have been working with the Enviroschools not-for-profit trust to help children plan, design and implement sustainable projects. The children are also becoming catalysts for change in their families and the wider community. Each year Enviroschools releases a snapshot of all the centres and schools involved to showcase their projects. Toru Fetu Kindergarten, the first purpose-built Pasifika kindergarten in the world, came about because of the vision of the Tuvalu, Niue and Cook Island communities in Porirua. Wellington Kindergartens (now Whānau Manaaki kindergartens) supported the community vision after three playgroups wanted to extend what they offered to families, while keeping their language and culture alive. Niue Aoga Tama Ikiiki, Cook Islands Te Punanga Reo Kuki Airani Porirua and Tuvale Akoga playgroups were all operating in Porirua East. The Ministry of Education provided some of the funds for the building, and the kindergarten opened in 2010, with separate classrooms for each of the cultures, and a shared playground. There’s also a large communal kitchen with free healthy lunches provided for all children attending Toru Fetu. It offers a space for the whole community to get together for celebrations, cultural events, family events, seminars, displays or other activities. This helps families stay involved in their children’s education. The idea of Toru Fetu was to increase the participation of Pasifika children in high quality early childhood education. This has been achieved with the close relationships with teachers and the families. Toru Fetu space is also used for playgroups and for professional development. More than 260 Pasifika families are achieving goals relating to health, finances, education, leadership and cultural knowledge thanks to Whānau Manaaki's work. As part of a Whānau Ora programme funded through Pasifika Futures, Whānau Manaaki kindergarten has been working with families to help decide on their priorituies for a successful future. Whānau Manaaki manager Danny Mareko says "it's long term work, and the ideas come from the families themselves. They can see the progress that is happening." “The YMen Project” is an initiative developed by Whānau Manaaki Kindergartens in conjunction with the Ministry for Social Development through Work and Income, and with the support of the Todd Foundation. The premise behind the project was first developed in 2008 to address the chronic shortages of men working in early childhood education and high rates of unemployment among men under the age of 25 years. The latter is less about getting people off benefits and more about empowering young men and giving them the confidence to realise their potential. The first cohort of YMen was established in 2011, and proved highly successful. Subsequent cohorts in 2012 and 2013 were established, with delays to the introduction of the fourth cohort due to funding changes in the Ministry of Social Development. The forth cohort of YMen has been confirmed and begins in September 2016. Below is a Video from Close Up (a programme on TV1) that aired 2 August 2012, that talks about this project.